companions for many people around the world. Whether for professional or personal use, whether you are on the move or at home, mobile devices have become an indispensable part of our day-to-day lives. So why not use them to make payments as well? For years now, experts have been discussing the potential for mobile payments to become a new trend. After all, the idea of paying with your cell or smartphone seems quite appealing, rather than fumbling around with cards or cash. However, anybody who thinks that this is already a matter of course would be mistaken. As early as the mid-1990s, when cell phones were increasingly creeping into our daily lives, people put a lot of thought and effort into the concept of using cell phones instead of change or cards to make payments. The launch of Apple’s iPhone in 2007 marked the beginning of the smartphone era – and with it, it also fired the opening shot for new developments in mobile payment transactions. However, a breakthrough in these transactions and their widespread adoption is still not in sight for the time being. This is revealed by the results of the “GfK FutureBuy” study, conducted around the world in fall 2015 and 2016, in which 25,000 consumers from 25 countries (2015) or 20,000 consumers from 20 countries (2016) were asked about their shopping and paying habits on each occasion. solutions can prevail. Various new ways of paying have been introduced in the past few years, such as ApplePay, Android Pay, contactless transactions or special chip cards. But so far they have not been able to pave the way towards a cashless, cardless future for the vast majority of people. Evidently, users are yet to be convinced about the comparatively new ways of paying offered by smartphones or tablets. relevant information. A comparison of payment habits in the USA and in Europe – with an additional focus on Austria and Germany in particular – shows different preferences. In the USA, consumers use cards much more often than other payment methods; according to the respondents around two thirds of transactions (65%) are processed using credit or debit cards, with the latter proving to be the preferred of the two options at 35%. Customers use their cards in the classic way most often for these payments, meaning that they insert their card in the card reader and enter their PIN number. Contactless card transactions account for 15% of transactions. 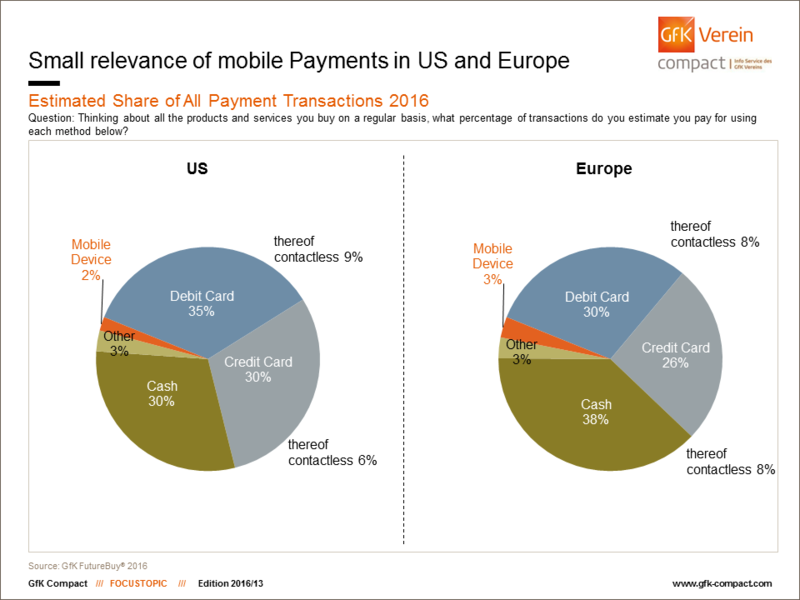 In Europe, the variety of payments is different: According to answers provided by European consumers, 56% of transactions are made by card payments, which is clearly lower than the level in America. But similar to USA a total of 16% of these are contactless. Cash payments play a more important role in Europe than in the USA, with 38% of all transactions still being paid in cash according to the Europeans’ responses. the “cashless country” a few months ago, where even church collections are cashless in some places. Whilst cash is disappearing more and more in Scandinavian countries, Germans and Austrians are still clinging onto their euro bills and coins. The motto “cash is king” applies equally to German and Austrian consumers. 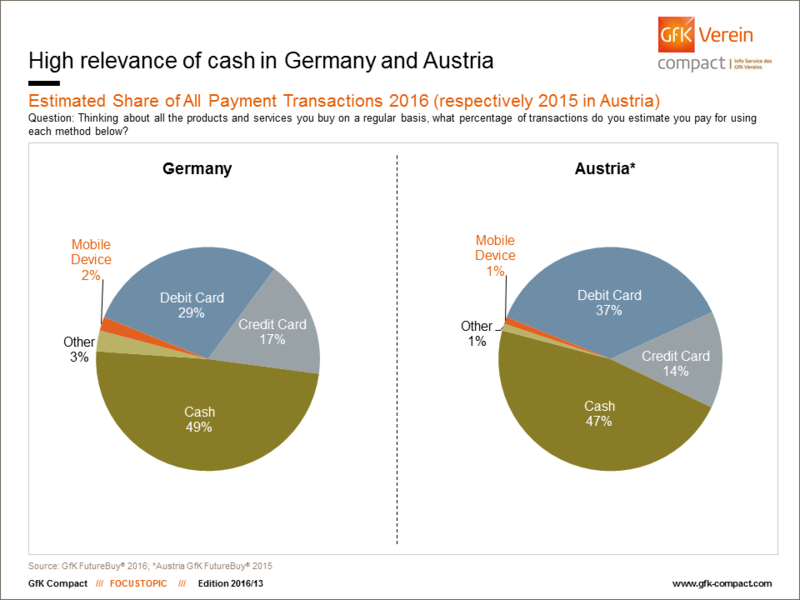 Germans estimate that they conduct 49% of their transactions in cash, while the value for Austrians is 47%. If they don’t have any cash on them, citizens of both countries are most likely to reach for their debit cards: In Germany and Austria, a total of 29% and 37% of transactions are made this way respectively. Credit cards are used even less frequently in both countries: 17% for Germany and 14% for Austria. Austria and Germany are good examples of just how important it is to introduce new technologies when it comes to generating interest in cashless payments. Acceptance has clearly increased since financial institutes in both countries started to introduce contactless payment functions for small amounts settled by debit and credit cards. For example, in Austria, contactless NFC payments were introduced by PSA Bank in 2013, with the aim of ensuring that every newly-issued card was equipped with a contactless payment function by the end of that year. As a consequence of this new feature, the use of NFC functions skyrocketed: In December 2014, 1.86 million contactless card transactions were made. In December 2015, this number had already reached 4.37 million (source: Payment Services Austria (PSA) ). We can assume from this that this development has also reduced reservations about using cell phones to make payments. And also every country’s government should make efforts to support a move towards a cashless society. The reason for this is that having data on all money transactions means having more control – for example, over possible illegal activities. 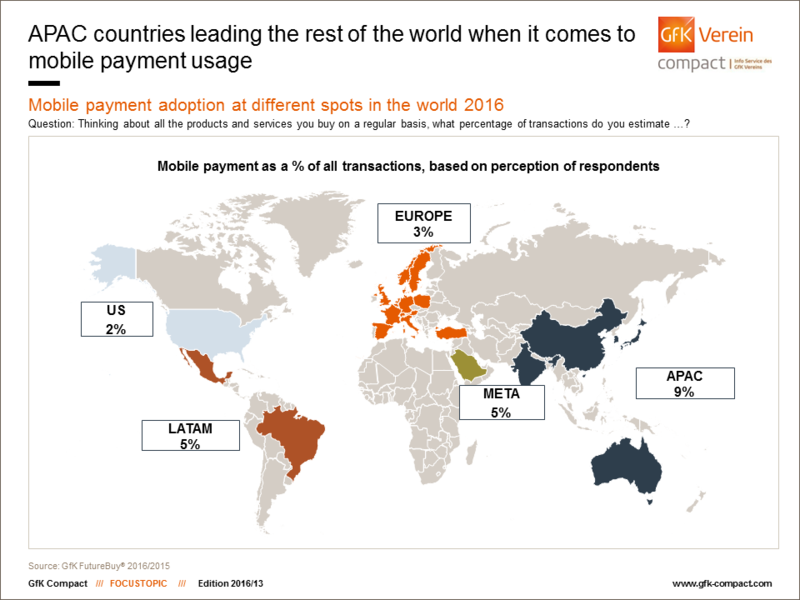 However, the smartphone payment market is currently still moving at a very low level. Above all, the issues of data protection and security are important reasons as to why consumers in parts of Europe and in the USA do not pay more often using a smartphone. The general public does not really believe that personal information is protected sufficiently. For example, at present only 8% of Austrians think that mobile payment methods are 100% secure. Safety concerns are presenting a major obstacle in Germany and in the USA as well. In Germany, 14% believe that mobile payments are completely secure and in the USA, this figure is still 20% (source: FutureBuy 2015 and 2016). 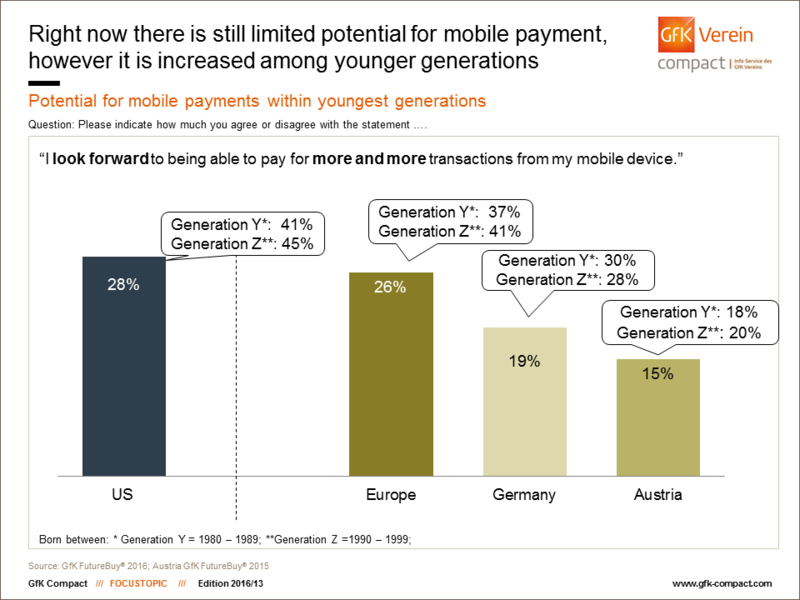 Younger generations offer a better chance of progress when it comes to mobile payments. First, smartphone use is widespread among Generation Y and Generation Z. Second, these generations are much more open to using smartphones for payment purposes. Whilst approximately 28% of Americans are looking forward to using their cell phone more as a digital wallet in future, this figure is 41% among representatives of Generation Y and even 45% for Generation Z. In Europe, the numbers are almost as high: Around one in four people presume that they will use their cell phone more often for payments in future, compared with 37% in Generation Y and 41% in Generation Z. And although the skepticism in Austria and Germany, even among younger people, is comparatively higher than the European average, young consumers there are still considerably more open-minded when it comes to mobile payments than older users. If you have any queries concerning this article, please contact Tim Spenny (tim.spenny@gfk.com) or Christina Tönniges (christina.toenniges@gfk.com).